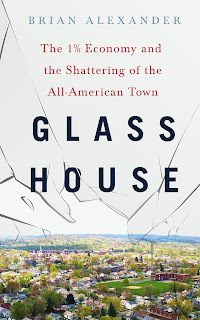 Brian Alexander’s new book, Glass House, tells the tale of how Wall Street wrecked Main Street and profited at the expense of the ordinary people of Lancaster, Ohio. 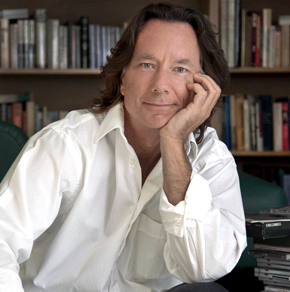 An award-winning journalist who has received the Medill School of Journalism’s John Bartlow Martin Award for Public Interest Magazine Journalism, Alexander has written about American culture for decades. The special perspective he brings to Glass House, however, comes from the fact that Lancaster is where he grew up. Stay Thirsty Magazine was very pleased to visit with Brian Alexander for these Five Questions and to learn more about the human consequences of the shattering of an All-American town. 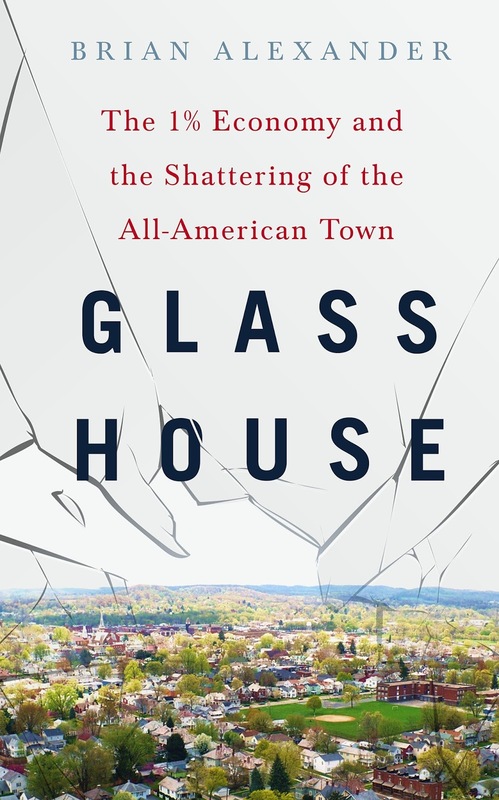 STAY THIRSTY: In your new book, Glass House – The 1% Economy and the Shattering of the All-American Town, you chronicle the current collapse of Lancaster, Ohio, a place once lauded as the epitome of the all-American town. Your book has been called, “a compassionate, but clear-eyed description of how deindustrialization, financial speculation, union-busting and deregulation undermined the social fabric” of your hometown. How painful was it for you to follow the residents of Lancaster as they wrestled with heroin, politics, high-interest lenders, low wage jobs, technology and the demands of 21st century American life? Lancaster, and many still love their town. nostalgia and not just see the town through my own younger eyes. I had to tease out what might just be me missing something that once existed from the new reality. It was difficult to chronicle Lancaster’s diminished sociability, it’s poverty, it’s new attraction to guns, the drugs, and the once mighty Anchor Hocking Glass Company because though I left Lancaster as a young man, I didn’t leave it because I disliked it, I left because I wanted to go out into the world. Lancaster still existed in my head, though. I dreamed of it often. And seeing its difficulties now was very like witnessing the troubles of a close friend, or a family member. The pain was made even more acute when my mother and my brother both died during the reporting of the book. Neither lived in Lancaster any longer but people would stop me to talk about them, or my dad. One day an older man stepped up to me in a bar, having heard I was an Alexander, and asked if I was Bob Alexander’s son. When I said yes, he talked about how much he liked and respected my father, how my dad had once helped him. So there were many emotional days. Still are. STAY THIRSTY: The lens through which you view the story of Lancaster is a very personal one and during the writing of your book both your mother and your brother passed away. How do you think they would feel about your completed work? Would their views be representative of the people of Lancaster? the people in the book. When I was first reporting, she gave me tips on who might be a good interview, or gossip to check out. My dad would like it, I think. He had a strong sense of outrage about business he saw as unethical. And he had a strong affinity for factory guys. He started in a factory, a tool-and-die shop. I know they’d both be proud and I do think they would feel it accurately reflected the facts. My brother, who was also a writer, would be proud, too, but he wouldn’t say that out loud. He’d ding me for whatever mistake he could find and then crack a joke about some part of it. He was actually thinking of going back for the county fair when he died. STAY THIRSTY: Of all the people you met and interviewed for Glass House, which ones stand out in your mind and why? BRIAN ALEXANDER: They all do because they’re such strong characters with all their flaws and admirable qualities. But I know that’s not what you want. I’d pick Brian and Mark, probably – who know each other, a fact I didn’t realize until late in my reporting, though I should have suspected it. Brian is a little like a Greek chorus, the conscience of the book, the town, of America. He’s trying to figure it all out but America doesn’t make it easy for him. We’ve become friends. I like to think I became friends with Mark, too. Mark struggled the whole time with his dope addiction. He tried to kid me about what was up but I knew he was kidding me and he knew I knew but we sort of had an unspoken agreement not to dime him out because he also knew he was kidding himself. I liked Mark a lot and rooted for him to stop heroin and face his life. I liked Lloyd. I just received a letter from him, from state prison. Of course, the driving force of the book is Sam Solomon, the CEO of Anchor Hocking. Sam is funny, smart, and very aware of who he is and what he’s about. He’s a success-driven guy, but there’s this other segment of his brain that questions the rightness of things. He exists on a kind of high wire, or multiple high wires: a black man in a nearly all-white business world (and in a nearly all-white town), a man born in a poor county hospital in North Carolina who got rich, a man who wants to play and win the game, but on his terms. He finally has what he thinks might be his launching pad, into the truly big time, and I could feel him thinking ahead to that future success even as he fought the battles of the now. STAY THIRSTY: How did American values become the victim of Wall Street greed? Will the middle class ever recover? What is ahead for their children and grandchildren? BRIAN ALEXANDER: Oh, boy, I could write a book about that. Wait, I did! Multiple ways. Glass House focuses on one way in particular, but before I get to that, I want to point out an overarching theme. There was long an implied social contract in effect in this country. It said that if you hold up your half of the bargain – work hard, play by the rules, take an interest in your family and community – capital would play by rules, too. It would pay you decently. It would invest so that the company you worked for was strong and could help you produce good products or services, stuff in which you could feel pride. You’d get a decent retirement, could afford a decent house, could send your kids to decent state universities. That contract did not appear out of thin air. It was fought over. People sometimes died hammering it out. But for about 50 years, roughly 1939 to 1980, it prevailed. Glass House focuses on one way the 1% Economy has fed on the bones of that old social contract. Anchor Hocking first fell prey to Carl Icahn’s greenmail, then to a hostile takeover, and, finally, and most tragically, into the hands of private equity. These are the new leveraged buyout firms that use companies like Anchor Hocking as a platform for financial engineering that enriches the PE firm’s partners, and sometimes the PE firm’s investors, but impoverishes companies, and, by extension, the people who’ve spent their lives working for those companies. Is it any wonder there is so little faith? Without faith we’re a doomed country. It’s a betrayal of the American social contract. And that betrayal has very real consequences, as Lancaster, and a hundred other towns like it, discovered. As for what’s head for the children and grandchildren of the middle class, I’m worried. A lot of young people in Lancaster, and towns like Lancaster, believe in nothing. And why should they believe? They grew up during the Great Recession, when all the smart finance guys said to trust them, they’d rule the world and deliver prosperity. Wall Street, Silicon Valley, big business, politicians, all thought they were the smartest people in the room. Trust them. Well, their families got screwed. But all the people who screwed them are doing just fine. And now some of those people are literally feeding off what’s left behind. I’m thinking of PE shops and car title loan companies, for example. It’s infuriating. You asked about my family, above. Well, my dad, for one, a Republican capitalist through and through, would be infuriated, too. STAY THIRSTY: If the new administration fails to deliver on its promises, will the hardworking blue-collar class revoke its support and if so, when would that happen? BRIAN ALEXANDER: Look, I think it’s already starting to happen, but here’s the thing: the more people harangue and blame and call others stupid for voting Trump – Fairfield County went 60-40 for Trump – the less willing those voters will be to turn on Trump. Ever know anybody who was bilked out of cash? Often, they never report it. They’re embarrassed, ashamed, shy. And the louder they proclaimed how right they were to buy that swampland in Florida, the more embarrassed they are about admitting they were taken. In my opinion, Trump is a lying, sociopathic grifter. But me saying that doesn’t help move anybody in Lancaster. It would make them dig in. Eventually, over time, they’ll see on their own. I have a slide I use in my talks that shows how some of the very people responsible for wrecking Anchor Hocking are now close advisors to Trump, like Icahn, and Cerberus Capital founder Stephen Feinberg. I’d love to see some of the smarty-pants folks work eight hours in the hot end of a glass plant, then go out for a two-buck beer with the other workers and talk to them as equals. I love those guys. I disagree with them on many things, but I’d trust most of them a lot faster than I’d trust many with whom I do agree. Some of the nicest people I’ve ever met live in Lancaster, Ohio.